If you have decided to get a vacuuming and mopping robot, and you are considering a Proscenic, you might find this article helpful. 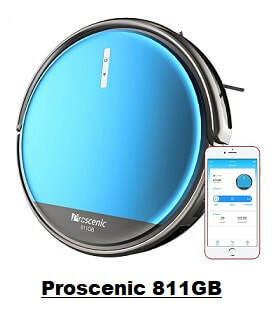 We will compare here the best rated and most popular Proscenic robots: Proscenic 811GB and Proscenic 790T. What makes these two robots so desirable is that they offer those important must-have features that every vacuuming robot worth considering should have, such as good floor coverage, easy transition from bare floors to low-pile carpets, anti-collision and stairs detection sensors, remote control, Wi-Fi suport, automatic docking and recharging, scheduling, high efficiency filters and a good warranty, but they are still affordable! Proscenic 811GB and 790T Robots on Amazon.com. 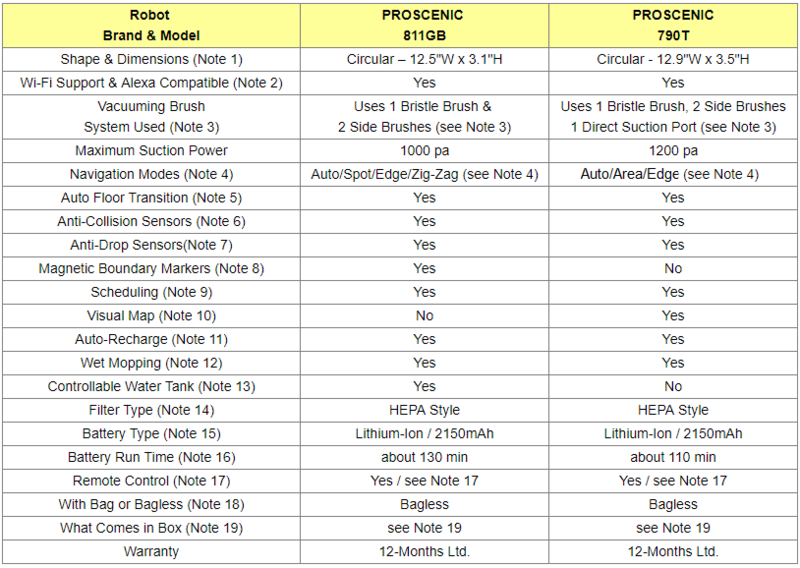 ​The following table compares the two robots. Please read the table notes that follow for a better understanding of the feature differences. Both robots are circular. Proscenic 811GB is a little bit thinner, only 3.1" in height, as opposed to 3.5" for Proscenic 790T, which means that it can go better under low lying furniture. It is also a little bit narrower, 13.5" wide, as opposed to 12.9" for Proscenic 790T, and therefore, it can also pass slightly better through narrower passages. Both Proscenic 811GB and Proscenic 790T come with one rolling bristle brush which is great for deep cleaning of carpets, and that can also be used on hard floors. Both Proscenic 811GB and Proscenic 790T are also equipped with double side brushes to clean effectively corners and wall edges. In addition, Proscenic 790T also comes with a direct suction port that can be used instead of the bristle brush to more effectively clean hard floors for vacuuming pet hair and debris without causing any tangles. - Auto Cleaning Mode: Used for daily cleaning of the entire house. The robot uses infrared sensors to cover effectively and thoroughly the space to be cleaned. - Spot Cleaning Mode: Used to thoroughly cleans small areas with concentrated dirt. In this mode, the robot cleans in a circle. - Edge Cleaning Mode: Used to clean thoroughly corners and along wall edges. - Zig-Zag Cleaning Mode: Used to clean in a back-and-forth methodical way larger open areas. - Auto Cleaning Mode: Used for daily cleaning of the entire house. This robot is built with the iPNAS Programmed Cleaning System Automatic Navigation system that provides precise location, smart mapping and follows a logical cleaning pattern (not random) that covers all of the floor. - Area Cleaning Mode: Used to clean thoroughly selected (2m x 2m) areas. Based on your home's cleaning needs, you can select where and how to clean according to any of the various cleaning modes. ​The various modes can be chosen using either your remote-control device or the app on your smartphone. Both robots can transition with ease between different types of floors, be it hardwood, laminate, tiled or covered with low pile carpets. Both robots can easily go under sofas, beds and around furniture, They can cross over 0.31 inch tall obstacles and 25 degrees slopes, clean along wall edges, avoid stairs and minimize collisions. Both robots are equipped with infrared obstacle detectors that reduce collision with furniture to a minimum during cleaning. Both robots are equipped with infrared anti-drop detectors that prevent the robot from falling down steps or stairs. Magnetic strips are easily cut to fit doorways, around pet bowls, or anywhere you don't want your robot to clean. Magnetics strips are included with the purchase of Presconic 811GB. With Proscenic 790T, the visual map of the space that is cleaned can be viewed on the app, and it allows you to better monitor the cleaning status of the room. When the battery gets low, both robots return to the docking station to recharge and be ready for the next run. Important Note: The docking station should be placed against the wall, and all obstacles from within 1 meter on both sides of the station and from about 2 meters in front of the station should be removed. Both robots are equipped with the optional mopping system that uses a cleaning cloth attached to a reservoir. Once the cloth is attached and the mopping mode is selected, the mopping system dampens the cloth pad from liquid from the reservoir, mops the floor and dries it to a sparkling shine! With Proscenic 811 GB, the robot vacuums and mops at the same time. The vacuum picks up dirt/debris at the center of the robot and kicks it back into the dust bin, while the water tank oozes water onto a cloth pad at the rear end that mops behind as the robot moves. 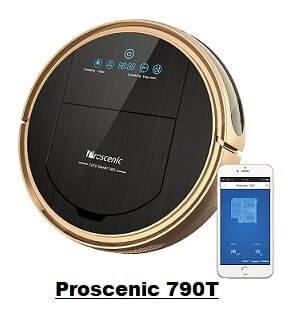 With Proscenic 790T, the robot does not vacuum and mop at the same time. You'd have to choose either vacuuming or mopping. For mopping you'd have to remove the roller brush, install the water tank and the mopping cloth pad. In order to avoid carpets from getting wet, it is recommended not to put water in the water tank when carpets are cleaned, and to remove any surrounding carpets when wet mopping is selected. When mopping is used with Proscenic GB811, because the water tank is equipped with an electronically controlled system, you can control the speed of water seepage from the water tank to the floor as you need. Three water flow rate choices, based on the specific need, are offered: Low, Moderate and High. Note that the robot will not ooze any water when it is stationary, docking, charging or paused; thus, you don't need to worry about leaks when it is not in use. Both robots are equipped with a HEPA style filter. HEPA stands for "high efficiency particulate air" and is a filter grade defined by the US Department of Energy which requires the filter to be able to remove more than 99.97% of particles. ​These filters are easily removed and cleaned. ​Note that for all vacuuming robots run times can vary extensively depending on the amount of work the robot has to do to clean the floors. That is because different types of carpets, different floor plans and different amounts of dirt may require different amounts of effort from the robot and hence different amounts of ''juice'' from the battery. So, the numbers given in the above comparison table should only be taken only as a guide, and not for exact run times. If you are close to the robot (within the same room), you can use the remote-control device that is provided. As long as your robot is connected to Wi-Fi, you can also control it remotely from wherever you may be, using your smartphone or tablet. Both robots are equipped with a dustbin that can be easily removed and emptied. No bags are needed. So which robot to buy: Proscenic 811GB and 790T ? Here we have two excellent Wi-Fi supporting very affordable vacuuming robots, and chances are you will be quite happy with either one. Powerful suction and an efficient brush system. HEPA filtering that clears the air from allergens, dust and particles. However, the two robots present a number of differences that you might want to keep in mind when selecting which to buy for your home. ​It is slighly thinner and smaller than the 790T, so it can go better under low lying furniture and can also pass slightly better through narrower passages. ​It offers four modes of cleaning (Auto/Spot/Edge/Zig-Zag) instead of three. It can vacuum and mop at the same time. Its water tank is equipped with an electronically controlled system which allows you to control the speed of water seepage from the water tank to the floor. It is built with the iPNAS Programmed Cleaning System Automatic Navigation sustem that provides precise location, smart mapping and follows a logical cleaning pattern (not random) that covers all of the floor. It has more suction power than 811GB. ​It gives you the option of replacing the bristle brush with a direct suction port so you can handle better hair and debris on hard floors. It provides you with a visual map of the space that is cleaned to better monitor the cleaning status of the room.